Julian Bell explained to the General Purposes Committee, (at 2.40 minutes in) why he thinks the deal with Mastcraft to convert the Town Hall into a Boutique Hotel is a good one. Is he right? A boutique hotel is unlikely to bring significant economic benefits to Ealing town centre, or achieve much change to its increasingly down-at-heel character. Anyway the deal apparently allows Mastcraft to convert the whole town hall into flats if it finds its hotel isn’t profitable. If this happens, and if the question arose we do not know how much scrutiny of it there would be, all the community benefits relating to town centre regeneration will be lost. The truth is that the Council’s recent record of transferring public assets into private ownership is unimpressive. The deals that have been done with developers are not producing the public benefits expected of them. The supposed benefits of the deal for Curzon Cinemas to take over Acton Library has stalled and the building has been empty since the library closed. Four years after it took over the Ealing Filmworks site under a CPO, and despite numerous press releases, St George has yet to start work on Ealing town centre’s long promised new cinema. The fact is that commercial businesses operate in their own interests to maximise profit, whether or not these are in the interests of the wider community. 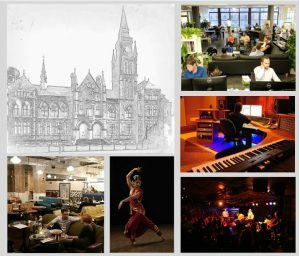 This is why Ealing Voice argues that a better future for the Town Hall would be to evolve into a commercially focussed but community owned music, arts and business centre where it would serve as it was designed as a central hub for the entire Ealing community. Ealing Voice has prepared a more detailed analysis of the development options for the Town Hall. Let us know if you have any thoughts on what we say.